A very good piece on Nina Simone by Claudia Roth Pierpont in the current New Yorker, prompted by the controversial casting of a light-skinned actress to play the singer in a new biopic, reminded me of a piece I wish I’d never written: a review of Simone some time in the 1980s, in which I brusquely criticised her lateness on stage and outbursts of extreme rudeness directed at an adoring audience. The facts as I reported them were all true, but the scathing tone makes it impossible for me to read it today with a clear conscience. If I’d had a greater understanding of her problems, I’d have been a bit more sympathetic. I mention this because I’ve been thinking about another piece I regret having written: a column in the Melody Maker in 1976, about the launch of a Liverpool band called Deaf School. I’d met them a year earlier, when I was running the A&R department at Island Records in London. They were recommended to me by another Liverpool band, called Nasty Pop, whom I’d just signed and who were part of the same art-school nexus. I went up to see them, enjoyed their show, liked them as people, and briefly showed an interest. There were about 10 of them, and they were a troupe rather than a band. If you can imagine a cross between Roxy Music (the ’50s futurism) and the Bonzo Dog Band (the ’20s whimsy), with a bit of Sha Na Na and the Shangri-Las thrown in, that’s what they were: exuberantly and amusingly theatrical, in a dressing-up-box kind of way. I liked that, as I liked it in the Magnificent Moodies, the performance art troupe of a year or so earlier. But I didn’t think the songs were great and it wasn’t a disappointment when Warner Brothers, in the person of the great Derek Taylor (the former Beatles/Byrds PR, turned managing director of WB UK), won a brief but fierce bidding war with Virgin, on whose behalf Richard Branson turned up at several of the band’s gigs. Enrico Cadillac Jnr (Steve Allen), Bette Bright (Anne Martin) and Eric Shark (Sam Davis) were the singers; they lost a second Bright Sister, Sandy (Sandra Harris), soon after signing their record deal, along with a couple of other members. Most of them had stage names: the keyboard player — an art teacher, as opposed to a student, called John Wood — was known as the Rev Max Ripple, and the bassist, Steve Lindsey, called himself Mr Average. The one I talked to most was the lead guitarist, Clive Langer (known as Cliff Hanger), who was effectively their musical director and the one who focused their ambitions. Clive knew a lot about music and we had some interesting conversations. Warner Brothers spent a lot of money on the band, fronting up for three albums and a tour of America. The forces of history and changing taste, perhaps as reflected in one newspaper column, conspired against their chances of making the kind of breakthrough achieved by Roxy Music, their early idols. They broke up in 1978 and I didn’t see any of them again until last year, when Clive Langer got in touch. Over a cup of coffee in Soho he told me about his years spent successfully producing Madness’s hits. He also gave me a copy of Paul Du Noyer’s book, in which I read for the first time of the damage that column had done to their morale. But Clive didn’t bear a grudge, and the other day he invited me to one of the reunion gigs they’ve been doing from time to time over the past 25 years. This one, on Friday night, was the first of two at the Islington pub near the Angel, arranged as a warm-up for the Rebellion Festival in Blackpool on Sunday and a short tour in November, including four nights at the Borderline in London. Two of the original band, the drummer Tim Whittaker and Sam Davis, are dead. Gregg Braden has been the drummer since last year, but the rest are as they were on 2nd Honeymoon. Clive is a record producer (and co-wrote “Shipbuilding” with Elvis Costello), Anne Martin is married to Suggs and is the mother of their two daughters, Steve Allen has been a solo artist and an A&R man for Warner Brothers, Ian Ritchie is a composer and session player, Steve Lindsey became a successful publisher with Island Music, and John Wood taught various YBAs and Blur’s Graham Coxon at Goldsmiths College before retiring in 2010. The gig, on a hot night in a tiny room, and in front of a cheerful audience, was a blast: just the way I remembered them back in Liverpool almost 40 years ago, albeit with greater instrumental proficiency. The set was built up of material from throughout their history, including their most recent stuff, a rather good five-song CD released as Enrico & Bette in 2011, all delivered with verve and humour. One song really stood out: “Taxi”, not the J Blackfoot soul ballad of the same name but a composition by Langer and Allen, the band’s chief composers, and originally released as a single to promote their second album, Don’t Stop the World. Today it sounds like a lost classic of intelligent pure pop; goodness knows how it didn’t do for Deaf School what “Johnny Don’t Do It” and “Rubber Bullets” had done for 10cc, or what “Little Does She Know” did for the Kursaal Flyers. Here it is, in its original form, from Granada TV’s Manchester studios in 1977. A lot of bands missed the same boat in the mid-70s: others whose demos dropped on my desk were Burlesque, City Boy and Bebop Deluxe. But at least most of the members of Deaf School have survived and prospered, with enthusiasm intact. For wiping a bit of the gloss off an early moment of joy, I apologise. And if they’re around your way, they’re worth a trip in order to confirm that, as Pete Brown once wrote, the art school dance goes on for ever. 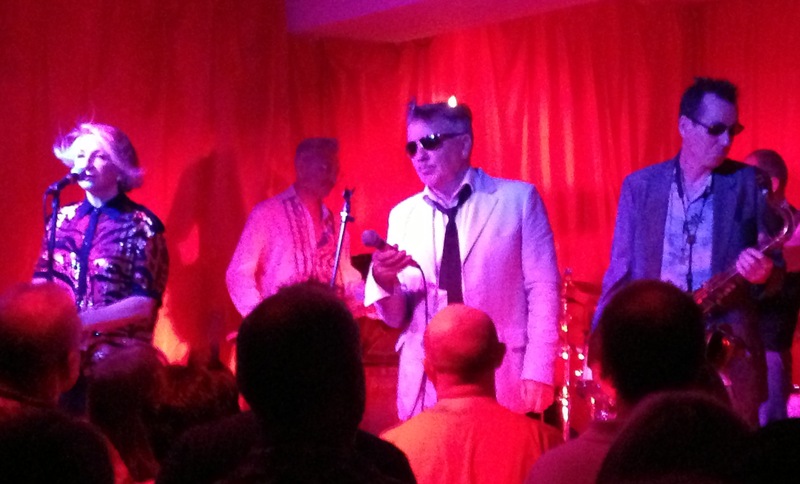 * The photograph of Bette Bright, Enrico Cadillac Jr and Ian Ritchie, with Cliff Hanger and Mr Average just visible in the background, was taken at the Islington pub on August 8, 2014. I remember there was one creepy guy in my high school who had all the City Boy records and tried to get me into them – first I’ve heard of them since. Much of Be Bop Deluxe, however, sounds better than ever and Bill Nelson’s solo work is worthy of investigation. Did you ever hear Orchestra Luna? They were a theatrical US “art school” band who got a deal and made a couple of records, I think. I saw them when they supported Roxy Music during a ’74 or ’75 US tour (the night that all the microphones got nicked during load out). I have some memories of Nasty Pop as I worked for them as sound man when EG Management took them on. I was glad to have a job as I’d quit Roxy earlier in the year (1976) and had immediately failed to become a successful record producer, though I did produce some competent demos for Robin Lamble, courtesy Island’s A&R budget. But it seemed that Nasty Pop were not about to become famous any time soon and after we headlined over the very interesting XTC at that famous pub on the Westway I quit to become a minicab driver (also unsuccessfully). I liked the band and was pleased to see that Keith Wilkinson went on to a steady gig with Squeeze. What happened to the others? Thanks, Chris. In answer to your final question: I wish I knew. John Fitzpatrick was a very gifted songwriter and Anthony Wimshurst was a terrific guitarist. It amazes me that they disappeared from sight altogether after the end of Nasty Pop. If anyone has information on what they’ve been up to, I’d be delighted to receive it. Thanks for your kind words. I also hold really good memories of those times with you. In answer to half your question …… a potted history would be that I abandoned the music business for business management, became an Irish citizen and left England for Belgium, France and now Switzerland. But Anthony Wimshurst (“Wims”) was (and maybe still is) a truly world-class guitarist – I have often wondered what got in the way of greatness. trivia dept. – early City Boy featured guitarist and vocalist Steve Broughton Blunt, who went on to write and arrange people like Stacy Lattisaw and Cyndi Lauper. He went on to enjoy a career as an A&R man at Jive Records, where he wrote for, and a&r-ed, Britney Spears, amongst others.